1.Alpha Design is a professional and reliable web design company. 2.The team is very helpful and they always response quickly to my calls. 3.I find their costs to be very reasonable. 4.Their Hosting is reliable, fast and most of all the control panel is very easy to use even for people like me who aren’t computer experts. 5.The feedback I have received from my customers has been really positive. I have really enjoyed working with Alpha Design over the past few years. Alpha-Design’s service has been second to none – taking away an old website which was hard to maintain, and also awkward to use for visitors, and replacing it with a fresh, modern feel that can be updated with a few clicks and a great product for visitors to it. My name is Norman Eames, desigNE jewellery, and I design and handcraft unique resin jewellery. 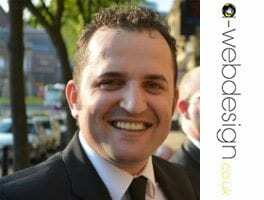 A friend of mine recommended a website designer, Ioannis Ntizoglou of Alpha Webdesign. He visited my wife and I at home to discuss search engine optimisation of a new website we has just set up. However, after lengthy discussion, we decided to allow Ioannis to create a more professional looking site and he assured us that he could guarantee around 50 hits a day after a few months. He spent around 3 hours with us discussing the website and how he would be able to make it more visible on the search engines. He was incredibly patient and helpful. He advised us of cost, which we thought very reasonable by present day costs in professional webdesign. He has given us excellent service, telephoning and emailing with regular updates. The website was delivered before the date he originally gave us and we think it is beautiful. Since making the website live he has given us tuition videos and personal tuition by telephone to ensure we are able to update it. We are very impressed with the personal attentive service he has given and we would wholeheartedly recommend Alpha Webdesign to anyone who wishes to have a professional, easy to use website with the addition of reliable, excellent service. We have great confidence in Ioannis and we know he always there to willingly help. Ioannis Ntizoglou has been truly wonderful since making our website. We have been with Ioannis for many years and he has always been available to help with any problem. We are very impressed with the personal attentive service he delivers to us and the reliability of him being available to us. We have only just changed over to a new mobile friendly modern website, he has given us tuition video and personal tuition by telephone to ensure we are able to update and any advice or suggestions. We are very impressed with Ioannis and would wholeheartedly recommend Alpha Webdesign to anyone who wishes to have a professional, easy to use website with the addition of reliable, excellent service. We have great confidence in Ioannis and we know he will always be available and willing to help no matter how little the problem was. Thank you Ioannis for being you. I would just like thank the guys at Alpha web design, especially Ioannis for all their help in the design, construction and input with our new website. Since the website has been on the web our sales have increased as in more business and customer awareness as we gets heaps more sales enquires, etc. Thanks Alpha Design, this company are certainly Recommendable and very Professional. The team at Alpha Web Design is one of the most professional and friendly I have ever worked with. With excellent customer service and prompt delivery of the site, we at The Craven Restaurant are very impressed with the service that we received. Alpha Web Design offer great value for money. We got exactly what we wanted without any bloated extras that we had no need for. We were treated as equals and not confused with jargon and technical terms; everything was explained to us to ensure that we got our money’s worth. I can safely say that Alpha Web Design is an honest and friendly company with the customers best interests at heart at all times. I would, and already have, recommended them to any one needing a website for either e-commerce or just for personal use. Alpha Web Design are great!